Obviously, I am thinking a lot these days about the concept of the Muse. Today, in addition to the Betjeman post (see below), I have two more Muse-related poems. And arts with thy sweet graces gracèd be. I've looked most everywhere, she can't be found. those thoughts and feelings locked within my mind. Her magic something only I could know. and played beneath where fragrant flowers grow. euphonic verses sadly left unsaid. that tell of things that only she can see. Her image fading more each day I wait. I pray for her return each day she's gone. Without each other we cannot create. Although I am 2.5 years late in finding it, fans of John Betjeman's poetry should love this story! Most people thought that Joan Hunter Dunn, who died earlier this month, was a product of John Betjeman’s vivid poetic imagination. Then, in 1965, The Sunday Times Magazine revealed that she was real and had lived exactly the kind of home counties life Betjeman fantasised about in his famous poem A Subaltern’s Love Song. 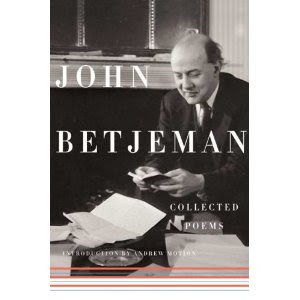 I recommend this volume of Betjeman's poems, from Amazon.